Fits silos from 12 to 24 ft in diameter. Designed for a longer lifespan, the reversible 9 ft ring is flanged to the inside for greater strength. High-performance, 10 inch auger features special hardened steel knives to effectively cut through and deliver hard packed and frozen materials. Fits silos from 12 to 30 ft in diameter. 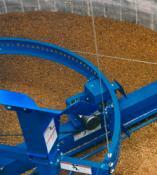 Gathering chain aggressively removes hard-packed and frozen feeds. High-volume delivery for fast feeding and reduced labor costs. 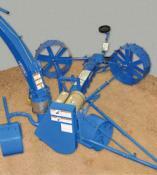 Easily adjustable to compensate for various feed and silo conditions. 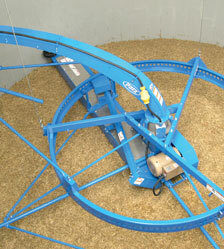 Self-sharpening power cutter follows exact curvature of the silo wall. Fits silos from 12 to 24 ft in diameter. Designed for a longer lifespan, the reversible 9 ft ring is flanged to the inside for greater strength. Gathering chain aggressively removes hard-packed and frozen feeds. High-volume unloading in the toughest conditions. Self-sharpening power cutter follows exact curvature of the silo wall.